Look Twice So They Can Live - ABATE Awareness Rally | Hupy and Abraham, S.C.
May is here, and with the warmer weather, many motorcycles will be on the road for the first time in months. May is Motorcycle Awareness Month and to bring attention to motorcyclists, many advocates came together for an awareness rally. The May 5 rally was organized by ABATE of Wisconsin and took place at Highway 100 and Silver Spring Drive in Milwaukee. Members from ABATE of Wisconsin gathered at the busy intersection with signs urging drivers to be alert and to look twice for motorcycles. Hupy and Abraham, S.C., a supporter of ABATE of Wisconsin for many years, had staff at the event to help spread the message. The firm has been an advocate for motorcycle awareness for decades, handing out various free materials at events, including Watch for Motorcycles stickers. 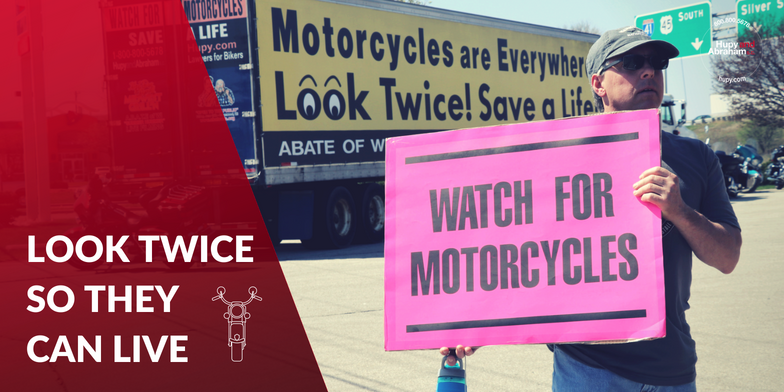 Working in conjunction with motorcyclist’s rights groups like ABATE of Wisconsin, Hupy and Abraham has distributed over 100,000 free bumper stickers reminding motorists to Watch for Motorcycles. In addition, millions of drivers in Wisconsin, Illinois and Iowa will see the firm’s many Watch for Motorcycles billboards on the highway. Together, with ABATE of Wisconsin, we can make our roads safer for everyone. Safety is everybody’s responsibility and awareness of motorcycles on the roads is a very important message, especially in the month of May.